I've always been fascinated by the historical accounts of the Napoleonic actions which occurred in urban or 'built up' areas. The names of Hougomont, Fuentes de Onoro, Aspern-Essling immediately come to mind as a few of the many pitched battles where the combatants furiously struggled for control of streets, buildings and fortifications. I have aspirations to do some of these larger engagements but my present collection is still too modest in size so I wanted to find something smaller to work with. I also wanted an action which I could more easily test the various rulesets that I have to see how they each handle combats in built up areas. During my reading of the Waterloo campaign I came across a reference to a letter Wellington wrote to King Louis XVIII on the eve of Waterloo. In this note the Duke cautioned Louis to be ready to retreat to Antwerp if the decision (at Waterloo) went against the Allies. (Louis and his court were in exile at Ghent - awaiting 'in the wings' to be reinstalled on the French throne.) Fearing the loss of the army if the campaign went poorly Wellington had always been prepared to fall back upon Antwerp for a sealift evacuation, if the situation warranted it. So my interest was quite piqued by this and I began to investigate further in order to better understand the mechanics behind this little-known 'contingency plan'. What I found was quite interesting and this gave me the idea to create a hypothetical scenario that focuses on a rearguard action where a lone British brigade holds a critical village in which to buy time for their retreating army. In broad terms Napoleon's objective at the start of the 1815 campaign was to launch a preemptive attack on the allies situated in the Low Countries in an effort to separate, isolate and destroy both the Anglo-Allied army led by Wellington, and the Prussian army led by the 72 year-old Gebhardt von Blucher. Once this was achieved Bonaparte would consolidate upon Brussels and pivot to face the Austrians and Russians who were still mobilizing. Napoleon's initial advance across the Sambre caught Wellington off-guard and the Anglo-Allied forces were forced to scramble from their dispersed billets in a desperate effort to consolidate and respond to the threat. Whether by accident or design this situation had Wellington promise the Prussians his support in their efforts in facing Napoleonic at Ligny when in reality none could realistically be provided. At the Battle of Ligny the Prussians were defeated, but not shattered. Nearing the end of the battle Blucher's horse was killed from underneath him and he was trapped under the corpse for several hours. He was later rescued and after a short time recuperated to take command of the withdrawl. In the Ligny's aftermath, Blucher's Chief of Staff, August Neidhardt von Gneisnau strongly advocated falling back east on the Prussian lines of communication, but Blucher decided to take a great gamble, move north-west to risk his army again in supporting Wellington at Waterloo. Messages were sent to the Duke telling him of Blucher's intentions. Meanwhile Napoleon decided to give Marshal Grouchy approximately a third of the French army in order to pursue and harass the Prussians as they fell back. Grouchy was to ensure the separation of the two allied armies and then rejoin Napoleon on his advance to Brussels. During the night of the 16th Blucher dies of internal hemorrhaging suffered from his injuries during the previous day's battle. Command of the Prussian army falls upon Gneisenau, who, after hard consideration, decides to countermand Blucher's orders to go to Wellington's aid and instead instructs the army to fall back on its lines of communication. He sends several couriers carrying notice of his intentions to Wellington and begins to move the Prussian army east. Nonetheless, these messengers are either lost in the torrential rain, killed or captured in the French pursuit and Wellington does not get word of the Prussian's change of orders. 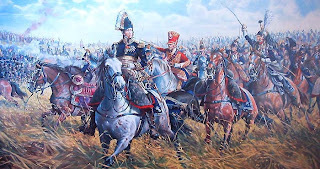 Wellington duly fights at Waterloo, but instead of Blucher's Prussians linking-up on his left flank it is Vandamme's French corps from Grouchy's pursuit which smashes into the weakened Anglo-Allied line. Wellington is killed just before nightfall, during the Guard's shattering assault upon the Allied center. 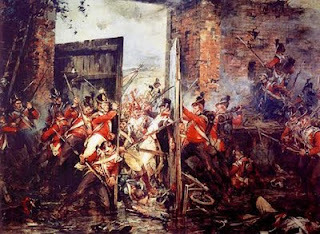 The wounded Uxbridge takes command and follows Wellington's contingency plan to fall back upon Antwerp in order to save the army. Chaos ensues but the drawing night allows the Allied army to disengage and begin its retreat. Previous to Waterloo Wellington had ordered a large pontoon bridge to be built over the River Rupel at the village of Boom. He also notified King Louis of this and suggested that he, along with his royalist court, be ready to flee to Antwerp if the Allies were defeated. The action depicted in the scenario begins in the late-afternoon of the 19th. Earlier that morning a composite British brigade had been sacrificed on the outskirts of Brussels to buy time for the army to prepare Boom for defense and to allow the army to begin its retreat across the Rupel. A rearguard has been formed to invest and hold the village as the French pursuit makes all effort to cut the British from their seaborne escape. Stung from Napoleon's criticisms of his command at both Quatre Bras and Waterloo, Marshal Ney has personally taken control of the pursuit in order to reconstitute his reputation. For both forces the stakes are incredibly high. If the British position collapses they risk losing their army and if this were to happen it is conceivable that London could seek a separate armistice with Napoleon. Alternately if the French loose too many men in this endeavour they may critically weaken themselves for the upcoming struggle against the Russians and Austrians. The French are commanded by Ney who has personally taken control of the pursuit. In terms of 'Republic to Empire' Ney is classed as Skillful (+2) plus 2 Dav (1 for each brigade). For 'Black Powder' rate Ney as an 8 Commander with High Aggression (+1 to his Command value when giving orders to charge) and +1 Combat rating. For infantry, the French will have six to eight battalions. These will be organized into two brigades of three to four battalions each (we played with three). Within each brigade we classed the first battalion as Veteran, the second as Drilled and the last as Conscripts. If you have four battalions per brigade I'd suggest a Drilled classification for the additional battalion. The French will also benefit from having a full battery of medium Foot Artillery and a regiment of Light Cavalry. We organized the two brigades so one would have the artillery attached while the other controlled the cavalry. The British are commanded by Major General Frederick Adam. For 'Republic to Empire' Adam is classed a Competent (+1), plus 1 Dav (1 for the Rearguard Brigade). For 'Black Powder' rate Adam as an 8 and has a +1 Combat rating. The British will have three battalions. I suggest making them all of high quality as they will be quite hard-pressed straight from the beginning. The British will also have a composite battery of guns, survivors of the retreat from Waterloo. One section of the battery (1 model) should be 9pdr field artillery whereas the rest should be 6pdr Royal Horse Artillery. At the end of each turn the British player (or umpire) rolls 2D6 to see how many ‘factors’ of refugees/units have managed to move across the pontoon bridges to safety. The French Royal court is composed of 4 'factors'. Each time a ‘6’ is rolled from the above a royal court factor has managed to escape across the Rupel. Louis is represented as a 1 on a D4 otherwise he is the last of the royal court to go across the pontoon bridge. Game Length: 12 Turns (4 hours) then the action subsides as night falls. If the French take Boom a general panic will ensue amongst the remaining refugees. Throw 3 last D6 for the final rush across the pontoon bridge (and those who are strong swimmers) but the remainder surrenders to the French. I haven't wrapped my head around how to do online maps yet so bear with me - I took some pictures of the set-up I used of our game. This is a 8x5 surface though I'm sure that this game could fit just fine onto a 6x4. The scenario runs down the length. The village of Boom is at the extreme end, along one of the short edges. The French will basically start from the opposing end and advance on Boom. The River Rupel (along with the fugitive British army and refugees) is beyond the village, off board. I strongly suggest placing a few terrain features (i.e. stone enclosed fields, hedgerows, etc) in intervals along the length of the board. This will allow the British some cover if they wish to try a fighting withdrawal back to the village. I placed the village of Boom on a slope as many rulesets give a benefit to the defender if they are uphill. Before the game stars determine if the French players wish to sacrifice time for a perparatory bombardment of the village. This reflects Ney rushing the guns to the front of the pursuit column and deploying them in advance of the rest of his force. If no preparatory bombardment is chosen then the British can deploy their troops as far as 30" from the French side of the table. The French can deploy their troops 12" from their table edge. 9” Zone of Control extends around the village. 3 Consecutive Combat Victories are required to secure the village. Village can accommodate 1 normal-sized battalion (8 bases) along with a section of guns (1 base). A unit in a built up area has a shooting value of 2 per facing up to a total maximum equal to the unit’s shooting value. A unit in a built up area has a combat value of 2 per facing up to a maximum equal to the unit’s combat value. A unit in a built up area has a +2 moral bonus for shooting a fighting. A unit in a built up area has a +3 Hand to hand fighting bonus if it is a large unit or standard sized unit, +2 if it is if small and +1 if tiny. Artillery gain no bonus. A unit in a built up area ignores results that oblige it to retire and will hold their ground without becoming disordered instead. The speed of the pursuit has caused your force to outstrip the Army's cavalry support. Reports of a large body of Allied cavalry on your flank compels you to form square with some of your infantry. Roll to see which flank and then roll to determine which two battalions are forced to form square. "The woods to our flank are thick with enemy skirmishers!" One battalion (randomly selected) is pulled away from the pursuit to move offboard to secure a flank. The battalion does not count as a casualty loss in regards to the scenario. Once offboard for 2 turns it will return on a 5-6 rolled at the beginning of the French turn. It will arrive 3D6" from its original departure point (French player's choice). Ney receives an order from the Emperor who reminds him of his recent failures at both Quatre Bras and Waterloo and so hectors him to attack. Ney will join the nearest brigade to the village to lead an assault on it immediately. If an assault is already underway Ney will wade-in as part of the attack. Ney will have a +2 MP (or Command) modifier which he will use to 'motivate' the attack. "The gun teams have brought up extra caissons!" For this turn all your artillery can fire twice but if any three dice come up as 1's a gun section is lost due to bursting a breach. The section commander of the Foot artillery section recognizes the pennant of the French dragoons as belonging to the regiment that over-ran his batter during the withdrawal from Waterloo. The Foot section will make every effort to make the Dragoons the priority target over any other. Each time they are required to target any enemy unit other than the Dragoons they will need to roll a 4+ on a D6, otherwise they will continue to target the Dragoons. They will also receive a +1 firing die when firing at the Dragoons. The pioneers that were tasked with the construction of the pontoon bridges have been released to assist int the defense of the village. The pioneers can either improve the village by 2D6 or assist in the defense as a fighting group. Rockets from a RHA battery deployed on the opposite bank of the Rupel plunge onto the battlefield. From this turn forward on every artillery step each side will select a single target point. Use targeting dice to determine any deviation. A hit causes 1D4 casualties and an immediate resolve/moral check to that unit (cavalry check at a -2 penalty). "Louis' carriage has overturned and is blocking the bridge!" Panic ensues. Roll for each of your units. On a 1-2 the unit takes 1D4 'hits' as men begin to panic and fall back to try to cross the river. Wow that sounds very interesting, maybe I can adapt it to to Lasalle. Love the idea of this game, it sounds intriging. I like the special events, they sound as though they could make the game very interesting, thanks for the post, I'm now following and looking forward to more posts!! Thanks guys. I must say I quite enjoy the freedom of creating these hypothetical scenarios as you're not so tightly bound to the conventions of history. We played your game scenario last Saturday. Was lot of fun, however some crew member did not like Black Poweder basic rule system. Shall check some proper amendments for napoleonic. @ skordly / Stefano: Well, I must say I'm very happy and honoured you took the time to try out the scenario. We had a lot of fun with it as well (we've adjusted the scenario several times since its original writing). What was it about Black Powder that some of your friends did not like? I'm curious to what changes you are thinking of (as we have made changes as well). All my best to you folks in Savona! Hi Curt, thanks for your compliments. I like Black Powder rule set quite a lot, however to give to it the real napoleonic tactical "flavour" I'll adjust first the movement and the fire ranges. I am keen to use the 66% reduced playing sheet. They have put some great work into this and you might find it useful for your own changes/adaptations. thanks for the useful advise. Shall check it out. We have planned other BP trial around middle/end of February. If interested shall post my comments/impressions. Stefano, yes, please send along any after action reports. Very interested to hear how you and your group do with your renaissance with Napoleonics. Very nice! How did the game turn out? Did the French carry the British/Portuguese positions? I quite like the Bavarians you have up as well. Lovely work. Sounds like a great game! I've been working on our own set of rules which incorporate many mechanisms from several designers plus a few of our own creation. I'll pass them along to you when they are ready for web-publication. We played yesterday BP scenario for Elchinghen with our 28mm. We had a pleasant day-off. We took a Age of Eagles scenario (http://napoleonicscenarios.weebly.com/uploads/2/3/7/7/2377799/elchingen_1805.pdf) and adptated it for BP.Unfortunately Loison/Ney division did not managed to cross the Danube fast enough (first two moves free only becasue they entered in column of march)) to avoid the early lucky arrival of Riesch Von Laudon reinforcement division at the end of the second turn.Mahler Division (french reinforcement) did not enter the table until the 6th turn, therefore the austrians could plan they defensive deployment and reject the french behind the Danube. The game finished at turn move n.8 with the Loison Divion routed and the Mahler reinforcement still partially on the Wooden bridge in column of March. Will upload some pictures to my photobuckel profile if interested. Great scenario! If possible can you send me your BP unit conversions for this engagement? (curtcampbell at mac dot com). I'd be very interested to try it out with my group here as it seems quite manageable and has a bit of tension. I look forward to seeing your photos of the game.